The club’s match against Peebles last Saturday was postponed following Wemyss’ sudden death. Head coach Davie Carson was responsible for recruiting the popular coach, who was a former Highland and North Midlands player and made his First Division debut at the age of just 17. 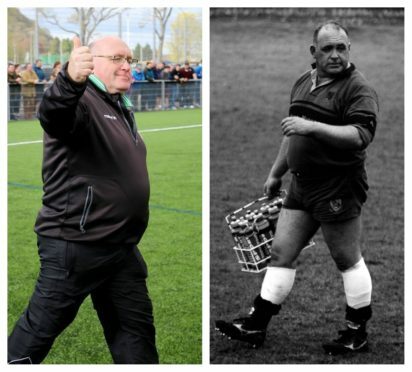 He said: “The death of ‘Porky’ as he was affectionately known to everyone in the game, is a massive loss to our club. “It was a tough couple of days last weekend after we heard the sad news but we will just have to kick on for this weekend’s game as he would have wanted us to. “If we were able to defeat the leaguer leaders and dedicate the victory to his memory, that would be the ideal scenario. “It was always going to be a massive game for us, even before the news last Thursday. It is first against second in the league but with ‘Porky’s passing the importance of the game has been raised a few notches. “We asked for last weekend’s game at Peebles to be postponed and instead we had a get-together at the ground with around 150 people turning up to toast his memory at three o’clock. Reflecting on the challenge ahead on the pitch this weekend, coach Carson added: “Everyone is fresh after the Christmas break and with last weekend’s postponement we’ve had an even longer break so we should be just about at full strength going into the big game.